Nicolas Jaar plus Guy gerber and more..
Free entry with invitation.. in an amazing place! Pacha presents Wisdom of the glove..with a super line-up! here you have the program of the event! Space presents: Ibiza calling.. with AN21 & Max Vangeli! Here you have the poster of the event! Tonight, Amnesia, La Troya + Paris Hilton! Wednesday in Ibiza..is the night of La Troya! The most creative, trasgressive, eclectic show of Ibiza returns with a new chapter! 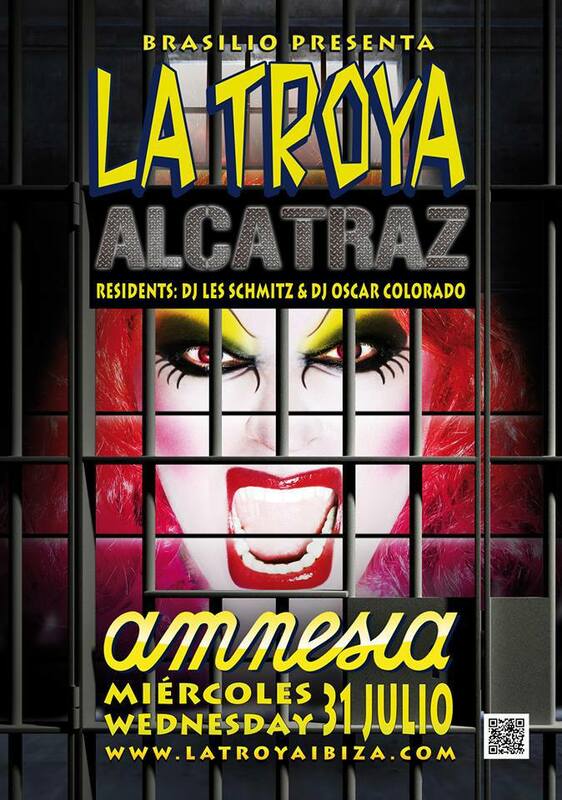 This week La Troya is named “Alcatraz”… can you imagine what could happen in the prison? If there is a show that gives the image of the soul of Ibiza, well, that’s La Troya! Tonight Dj residents will be Lex Schmitz and Oscar Colorado! Meanwhile, still in Amnesia, will find place also Foam and Diamonds…with Paris Hilton.. a glamour side in a super night! Ibiza by night lands in Sardinia! Ibiza by night, for the first time, will support an event the next 3rd of August In Sardinia, Italy! We are proud to meet Dj Ennetielle NTL, organizer of the event, that involved Ibiza by night in this elegant and unconventional project. Dj Ennetielle NTL explains the project:”In the beautiful surroundings of the Domus de Janas, looking over the village of Mores from Mount Lachesos, on August the 3rd from midnight, Fairies World – Il mondo delle Fate, will launch its very first event, a magical night of music, between unknown worlds, wrapped up in mystery. Fantastical worlds where legends of gnomes, elfs and fairies, will take you on an incredible journey of beats and notes! Suspended worlds in time, without borders! Are you ready to dive in and explore our Fairies’ World? PS Feel free to wear your themed costumes!”. Are you ready to enter into the magic world of Faires? Are you ready for a super tuesday in Ibiza! These are some suggested events for tonight! Starting at 5.00 p.m. , Luciano and friends are back! Tuesday at Space is the kingdom of Carl “the king” Cox..here you have the poster of the night and the complete line-up! Tuesday at Amnesia? It’s time for Together! The super – guest star for tonight is Afrojack, but the line – up includes also Shermanology, bassjackers, nero, Feed me, for an amazing Tuesday night! 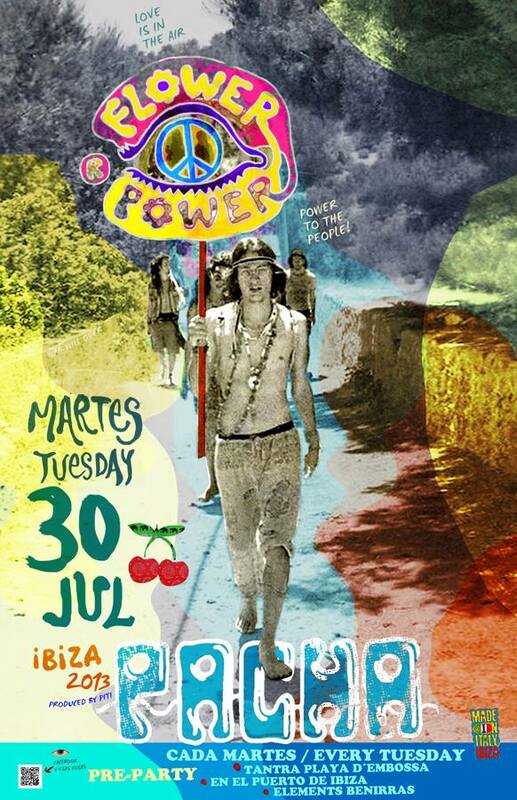 It’s Tuesday…is time of Flower power at Pacha.. for a night you could live the magic atmosphere of sixties! ready for a super party? 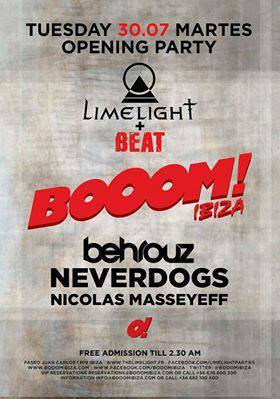 Bomba Ibiza presents: Limelight + beat opening party, with Neverdogs, one of the most appreciated dj group in Ibiza, Nicolas Masseyeff and Behrous! Amnesia, Space, Sankeys, Privilege and Booom! 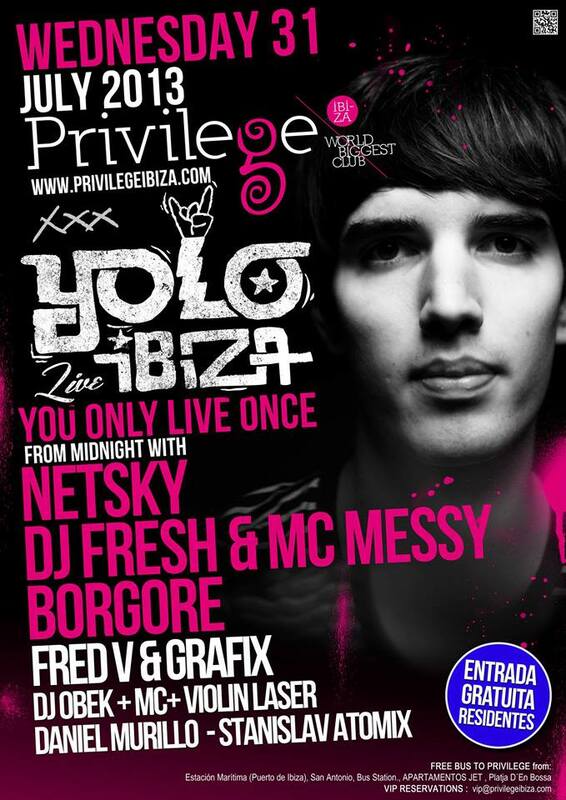 Saturday night in Ibiza! This is a list of suggested events tonight in Ibiza! Ibiza by night already talked about the Pacha, where will play Solomun.. ..so..let’s start with many other clubs! Amnesia presents: Popstar! With Pitbull and Brian Cross! If you like this kind of music..It’s a night not to miss! It Sunday and at Sankeys is Warriors time! 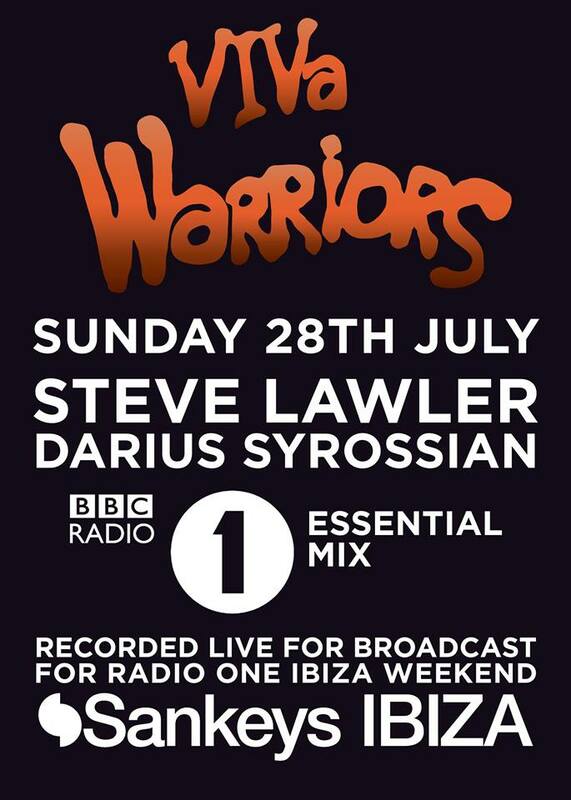 Viva warriorspresents Steve Lawler and Darius Syrossian! The set will be recorded for broadcast for radio one Ibiza weekend! Booom presents “CAdenza night”: tonight the line up includes Gianni Callipari, one of the most interesting young Dj in ibiza, Michel Cleis B2B Andrea Oliva and Cassius. 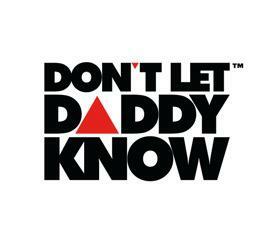 Privilege presents: Don’t Let daddy know..the amazing show of Sunday night! Sunday … daytime in Ibiza! Here you have a list of selected events for today in Ibiza! 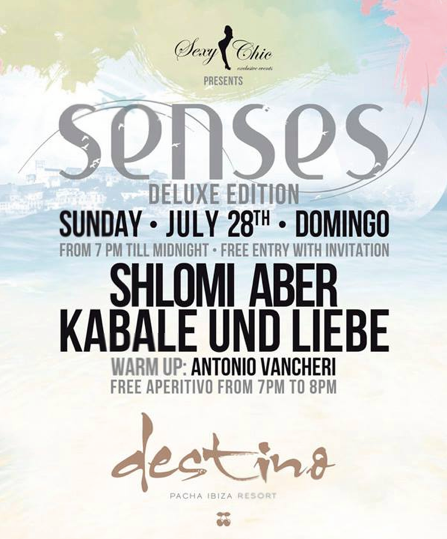 Destino ibiza, the elegant lounge hotel presents: Senses!, from 7 p.m. till midnight! Here you have the complete program of the day! Warm-up by Antonio Vancheri, plus Shlomi Aber and Kabale und Liebe! Ushuaia presents: Avicil! the show will start at 5 p.m. until midnight and with Avicil will play Arty and Rebecca & Fiona! 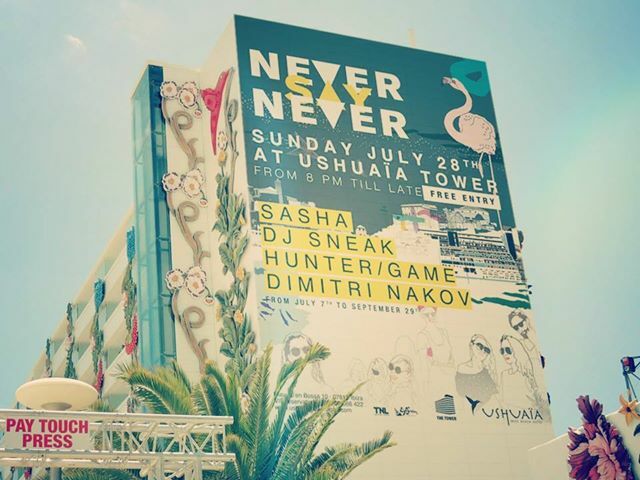 Ushuaia tower presents: “Never say never” ! The cult show of Sasha, also with super guests! Dj Sneak, Hunter/Game and Dimitri Nakow! Here you have the picture of the event! It’s Sunday time, is time for Solomun at Pacha! Solomun + 1 has become in a few weeks the coolest show of Sunday for summer 2013, a show where you can hear one of the best sounds in the island. Tonight with Solomun will play Dj Koze, and It’s guarantee of excellent music.